Google attempting to democratize Artificial Intelligence and Machine Learning. A few weeks ago, I had the good fortune to attend the Google Cloud Summit in Chicago. Google used the event to differentiate its Google Cloud Platform from the offerings from the two largest cloud providers, AWS and Azure. I would argue, that if you don’t know what to do, pick AWS. If your company is already heavily invested in the Microsoft ecosystem, then pick Azure. If you want to leverage the best data analytics and Artificial Intelligence (AI) and Machine Learning (ML) tools available, then you should seriously consider picking Google. The fact is that there aren’t enough data scientists in the world. There are approximately 21M developers in the world and less than 1M data developers. There are probably only a few thousand AI/ML developers. Google claims to be a data and AI company and they want to make advanced data analytics and AI available to more people. They have developed tools that don’t necessarily require data scientists or AI/ML experts for simple or more general cases. It is no surprise that one of the main themes of the summit was “The Democratization of AI”. Google has released a set of pre-trained AI building blocks that were built with Google’s data. These include models that are trained to recognize natural language, vision, and translated speech. You may ask “what does this mean to me?” There were some great demonstrations that showed the potential of Auto ML. It included all the steps needed to build a custom ML model including: data pre-processing, ML model design, ML parameter tuning, ML model evaluation, model deployment, and model updating. Google claims that Auto ML builds better models than most current open source models. In one example, a presenter uploaded about a thousand tagged images of clouds (I don’t know if the pun was intended). 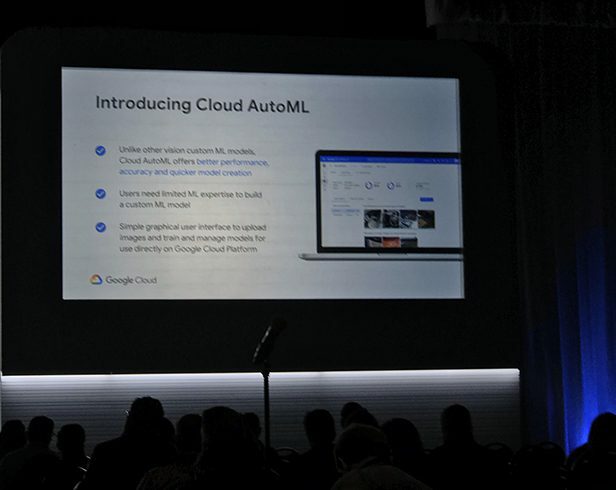 Using the pre-built vision model, the presenter showed an app that was able to predict the type of cloud in an image with an accuracy of over 90%. Using a natural language-based model, you can develop an application that scans incoming customer emails and automatically routes it to the appropriate department. This is something that can address a real customer need. Google also showed off the latest iteration of G Suite, their version of Office 365 (O365). Google claims that it’s secure, smart, and simple, and it is impressive. Google says that they currently have 4M paying G Suite customers which include WeWork, Nielsen, and Chicago Public Schools. Nielsen migrated their entire company to G Suite in a single weekend. It’s built on a different premise than O365. Historically, O365 was a tool set for a solitary worker that occasionally collaborated. More recently, Microsoft has bolted on tools like SharePoint and Teams to add collaboration capabilities. G Suite is designed around collaboration (Google says that 74% of all work is collaborative). Imagine an office suite built around Slack. That’s what G Suite looked like to me. Another way to think about it is as SharePoint on steroids (without the clumsiness of SharePoint). Oh, by the way, it can leverage their AI/ML tools fairly easily. You can use AI to build pivot tables and schedule meetings. As another aside, you can leverage their 3rd generation AI chips (TPUs – TensorFlow Processing Units) to speed up your ML models. Oh, and they also have custom silicon (Titan) for enhanced security. Google says that a better name for AI is “Predictive Analytics”. I tend to agree. The term “Artificial Intelligence” is not very descriptive. Google also advises that if a company is not good at data analytics, it is not ready for predictive analytics. Google may be the 3rd cloud provider today, but they are a potent adversary. I look forward to their future platform enhancements. This Blog, written by a former Senior Principal and Thought Leader, is used with permission from the author. Trexin welcomes comments and discussion on this topic. For additional information email Trexin at info@trexin.com.